There is always much ado about link-building strategies. Some are claimed to be the cutting edge, others are as old as the Rolling Stones; some are told to yield great results, others – to be the loss of efforts. 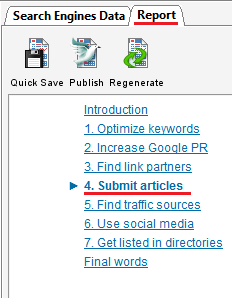 Today we’ll scrutinize somewhat classical strategy: article marketing or article directory submission. SEO SpyGlass comes with a list of article directories that you may use for submission. Ask Google for something like "list of article directories" or use similar search queries. As you know from our post on link-baiting, the lists of goodies drive traffic and help generate back links. Thousands of webmasters publish their submission databases to get more exposure. 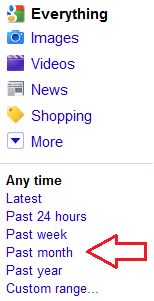 To refine the results and cut stale lists off just click on More Search Tools in Google and opt to show the results for the past month only. When equipped with the list, proceed to the next step. You may parse article directories from Google yourself. For this purpose you need to know the right queries and search criteria. There are a few popular free article directory scripts; each of them has some features that allow identifying them. For example, article directories built on Article Dashboard script are rather easy to find. Non-custom installations of this script should have a page ./login2submitart.php. So, the query to search for such article directories on Google will be "allinurl:login2submitart.php article" (without quotes). There is no point to be over creative; after all, the owners of minor article directories don’t expect you to write like Mark Twain. Just avoid universally inappropriate topics and observe guidelines regarding the size of each element of the article. Don’t forget to use your target keywords, 8-10 keyword phrases per 450 words is ok, in this way you are creating "relevant" pages for your links. If you do the submission 100% manually, for your own convenience highlight (make bigger spacing/ use various colors) the structural elements of the article, then it will be easier handle the information and copy/paste the element of the article. Keep in mind that normally you are allowed to insert up to three external links in your article. In most cases the external links may be inserted in the Resources section only. So you’d better not cram your links into Article Body, this will decrease the acceptance rate of your article. As you know Google devalues pages with duplicate content. Obviously, the results may be equal to nothing, if you submit the very same article to 100 directories. On the other hand, writing 100 unique articles is very time consuming, your efforts may be not worth it. Spinning your article is a tradeoff between quality and efforts. After: I like candies. / I love candies. / I like sweets. / I like candies. The more synonyms are added the more "unique" the article becomes. Currently, there are many off the shelf tools that will help you spin the articles. Make sure your output articles are as quality and worthy as the initial article. Always keep in mind that your article is intended for users and should bring some value to the Internet community. Spin the Title and Short Description harder than the other elements of the article; these two are used in page title, meta description in URL. Include one absolutely unique phrase or sentence in the Article Body. It will enable you to track your success rate. In a week or so after posting the article you may Google for this unique piece and get the list of approved and indexed articles. You may do this manually or make use of any software tools. Such well known automatic form fillers as RoboForm or AutoFill Forms plug-in for Firefox will save you a lot of time and they are just perfect for a one-time job. You may set them up to fill in your name, e-mail, password and other custom fields. Alternatively, there are all-in-one submission tools, but they are worth investing in if you plan to submit articles regularly and in large numbers. Hopefully, these tips will help you build more one-way relevant links. You may share your insights and success stories in the comments section.